A mob scene is probably the best way to describe what it was like outside Guu on a cold Thursday night. I knew it was going to be busy, but I didn't think it would be THAT busy. 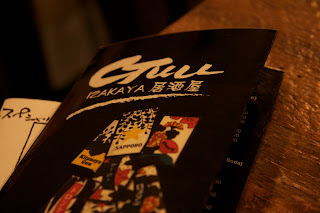 Guu, originating from Vancouver, opened in Toronto last December. Arriving at 6pm to an already full restaurant, we were told to come back at 6:45 by the door man/bouncer who took down our name. When we came back, he said he had called us 3 times, ughhh! After waiting another 15 minutes, hungry and cold, we were still excited because every time the door opened we could hear the chaos inside. And inside, it's a whole other story. When you walk in, you're overwhelmed by a few things, first the noise. The friendly staff screams when you enter and exit the restaurant. Also the decor and design is gorgeous. I've never been to Japan but apparently it's supposed to feel like you're there. We liked most of the food we ordered. Actually we loved the rice dish, which I couldn't find on the menu, but had read about in reviews (Butakimchi Bibimbap - rice, ground pork, kimchi, assorted vegetables and an egg). It came to the table in a hot stone bowl and our server mixed it all together for us. Wasn't sure about it at first but it was so delicious we ate every last bit. The mushroom tofu salad was also good, as was the black cod and the Japanese pancake (not exactly sure what was in it but that didn't really matter). The misses - the udon noodles with beef and the deep fried chicken. I'm sure some would like it, the chicken was super juicy, but I was just confused about what part of the chicken I was eating. Dessert was banana tempura with coconut and vanilla ice cream, a perfect way to finish the meal off, along with a loud goodbye from the staff. And back outside, there was still a line of eager people waiting for their go at Guu. The rice, tofu salad, and secret pancake were amazing! Deep fried banana with coconut icecream and mango/chocolate sauce... outta this world. That picture of the chicken balls might give me nightmares though. Notice my over-eager hand in the second rice pic... "STIR!!!!!!!" 2) Remember the evil kid in orange? ahhhh! sounds like an incredible dining experience. can't really picture the staff screaming though!